People would spit at us in the face. They put lit cigarettes down our shirts, and punched us in the stomach so hard we would fall on the floor, and then they kicked us. The American Nazi Party came, yelling white supremacist nonsense and telling us to go back to Russia. A sit-in challenges segregation at People’s Drug Store in Arlington, Virginia, in June 1960. David Hartsough is seated on the far right. Steet Spirit: Looking back at a lifetime of nonviolent activism, can you remember the first person who helped set your life on this path? David Hartsough: Gandhi. My parents gave me Gandhi’s book, All Men Are Brothers, on my 14th or 15th birthday. And Martin Luther King who I met when I was 15. Spirit: Why was Gandhi’s All Men Are Brothers such an inspiration? Hartsough: Because he said that nonviolence is the most powerful force in the world, and he believed that, and he practiced it. His entire life was made up of his experiments with nonviolence, his experiments with truth. He took nonviolence from being kind of a moral, theological, philosophical idea, and showed it could be a means of struggle to liberate a country. That was a great model for me that nonviolence is not just morally superior to killing people, but was a more effective way of liberating people. Also, his belief that all people are children of God. We are all one. We’re not black versus white, Americans versus Russians, good guys versus bad guys. We’re all brothers and sisters. I took that seriously and that’s what I believe. Spirit: What was your first involvement in a social-change movement as a young activist? Hartsough: When I was 14, there was a Nike missile site near where I lived in Philadelphia. This was when people were hiding under their desks in school or going into air raid shelters to try to be safe when we had a nuclear war — which is absolutely ridiculous. So I organized other young people to have a vigil at this Nike missile site over Thanksgiving. We fasted and we walked around with our picket signs in front of the place, and that’s where my FBI record started. Spirit: How do you know this protest was on your FBI record? Spirit: That is despicable. They didn’t have anything better to do than investigate a kid who is concerned about peace and nuclear war. Why did you get involved at such a young age? Hartsough: Well, the American Friends Service Committee, at that time, had programs and seminars for high school students in Washington, D.C., and in New York at the United Nations. My dad was working with the AFSC and with the people running these seminars where I met other young people from around the country that shared the vision of working for a just and peaceful world. That felt very empowering to me that I wasn’t alone, and nourished my young heart that this is what I wanted to do with my life. Spirit: How in the world were you fortunate enough to wind up in Montgomery, Alabama, during the bus boycott? You were there at the very birthplace of the civil rights movement. So during spring vacation of 1956, that’s what we did. We saw up front the injustice and the oppression people faced. On the way there, we stopped at Koinonia community, an inter-racial community in Georgia, and in the room where we slept, there was a bullet hole in the wall from a week earlier. That’s the way people were treating folks who were living inter-racially. So that was my introduction. Then Ralph took us around Montgomery, and we saw one of the churches that had just been bombed, and the pews were all in splinters, and the cross was hanging on its side. But people were getting up an hour earlier to walk to work every day, and people had caught a vision of a world that could be very different and were willing to struggle nonviolently. And they supported each other. We went to the prayer services that happened every night. We saw the car pools, and we saw the police arresting people for having an “illegal transportation system,” just for giving people rides. But people found the courage to face that violence and oppression. Spirit: When you witnessed the racism and violence people faced simply for organizing a bus boycott, what affect did that have on you at age 15? Hartsough: Well, it was much more than just reading Gandhi. This was a form of struggle where a whole community of people supported each other in working toward a vision of justice. They did not give up and were willing to suffer for it. Even when their churches were bombed, they still maintained their love and nonviolence and human dignity. Spirit: What a gift that was for a young person to be around Ralph David Abernathy at the very beginning of the struggle for civil rights. Did you also meet Martin Luther King on this trip? Hartsough: Yes, we met Martin Luther King and came to a meeting of the Montgomery Improvement Association, which was essentially made up of the pastors of all the black churches and one white church involved in the bus boycott. Martin Luther King introduced me and my brother Paul to the whole group. He said, “These young boys have come down from Pennsylvania to see our struggle and support us.” That was quite amazing, although I had no idea in 1956 that he was going to become this extraordinary figure who was going to help transform America. Spirit: You got to meet my all-time heroes — the people who launched the bus boycott, and triggered the entire Freedom Movement. What else do you remember about meeting Dr. King? Hartsough: Well, he seemed older to me, but he was really very young. He was 26 or 27. He was very congenial, even though we were just these young kids from out of town. He showed us his understanding and support and welcoming and friendliness. I think, even at that time, the other pastors were realizing that this guy was a gift from God. And the way he was conducting the meeting, it wasn’t a rush job, like, “I know just what to do.” Instead, he was gathering the ideas and suggestions and concerns from everybody, and then helping them find a solution, and helping to build that movement to be the effective movement that it became. Spirit: When we visited King’s first church, Dexter Avenue Baptist Church in Montgomery, a couple years ago, I saw the impact that visit had on you. What did it mean to find yourself walking inside King’s church again, an entire lifetime after you had first visited it in your youth? Hartsough: I remembered how inspired I had been at the very beginning, inspired by this man and this movement, and then seeing it develop into a powerful movement that helped transform this country. That movement not only challenged racial injustice, but challenged militarism and poverty and economic injustice. And I was some part of that, and I took part in the Poor People’s Campaign. But my feelings had changed from being inspired to now feeling reverence for this man’s life and the struggle that he had given important leadership to, even being willing to risk his own life to help transform this country. I remembered something King had said once in a church basement where there were 35 people. He said, “We have the power in this room, if we mobilize it, to totally transform this country.” He believed that, and he was able to help inspire other people to believe that and act on that belief. 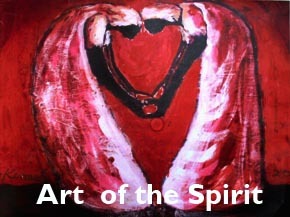 Spirit: King really was a prophet — a gift from God who delivered the ultimate challenge to the powers that be. What can we learn today from his example in building a movement to overcome injustice? Hartsough: Well, first, like Gandhi, he was taking the idea of nonviolence and really making that an effective means of struggle. King looked at the system of segregation and horrendous injustice in the United States, and applied the theory and practice of nonviolence in the struggle for the liberation of black people in the United States. Many Americans now do not really understand how destructive it was that in the mid-1950s, at the time of the Montgomery bus boycott, black people could not ride on the buses, could not drink at water fountains or go in the bathrooms, and could not stay in the motels. Children could not play in the parks. If you tried to register to vote in some of the deep Southern states, you could get lynched or fired from your job or find a burning cross in front of your house. The United States talks about terrorism now, but black people in the South experienced a lot of terrorism from a very early age, starting back centuries ago and into the 1900s and through the 1960s. So, in the face of that terror, and in the face of all that fear and injustice and hatred and discrimination, Martin Luther King helped people in the South find the courage and the determination to struggle nonviolently. I experienced that in Alabama in the spring of 1956 during the Montgomery bus boycott. It just really challenged me to the core that nonviolence and the method that King was using in Montgomery was a method that could be used to help transform this country. I was also inspired by the gunshot fired into the Koinonia house in Americus, Georgia. Spirit: Why in the world would it inspire you to see a gunshot that had been fired into the house you’re staying in? Hartsough: Well, it showed how deep the system of injustice and racism is in this country. They were willing to shoot into a house where they didn’t know the people, but those people believed in integration and brotherhood. They were saying that they were not going to live by the Southern mores that we must be separate. So partly inspired by King and the Koinonia inter-racial community, and partly inspired by Bayard Rustin, I decided to go to Howard University, which was an all-black university at that time. Spirit: How did Bayard Rustin influence you? Hartsough: I got to know Bayard when I was a young kid. He was a man with a vision. He’d been in federal prison for two years as a conscientious objector during World War II. He was the person that, perhaps more than anybody else, influenced Martin Luther King to deepen his understanding and his practice of nonviolence in the struggle for justice. He was a good strategic thinker, always very clear, and lived by his principles. Bayard was black, he was a pacifist, he was gay, and he was a Quaker — just about everything where society could say, “Well, those are second-class citizens, and un-American” [laughing]. He was all of those things, and he was proud of it. He understood the importance of building a broad-based, powerful movement. He organized the famous March on Washington in August of 1963, bringing together the largest demonstration that had ever happened at that point in Washington. And I could actually talk to Bayard Rustin at key times in my life as a young kid when I was wondering if I should go in this direction or in that direction. Spirit: What did attending Howard University mean to you? Hartsough: I really felt it was a step towards integration. My dad actually knew the president and vice-president of Howard, both of whom were friends of Gandhi. Mordecai Johnson, the president of Howard, was a very close friend of Gandhi. William Stuart Nelson, the vice-president, also was a student of Gandhi, and he taught my first class on nonviolence at Howard Divinity School. Spirit: How did you get involved in civil rights sit-ins while at Howard? Hartsough: I started at Howard in the fall of 1959. In February 1960, when four students sat down at the Woolworth’s in Greensboro, North Carolina, we at Howard University felt we should do something. So immediately after the four students were arrested in Greensboro, we started picketing at the Woolworth’s store near Howard. We did some research and found that everything in Maryland and Virginia was segregated. Even African ambassadors to the United Nations traveling on the main highway in Maryland could not eat at the segregated restaurants. 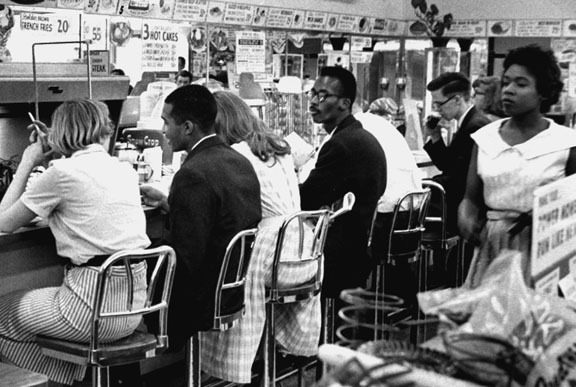 So we decided we would sit in at lunch counters in Maryland to challenge the segregation laws. Usually within a very short time, they would close the lunch counter and call the police, and we would be arrested, put in handcuffs and taken to jail. We’d spend the weekend singing freedom songs in jail, go to court Monday morning and go back to class on Monday. American Nazi Party leader George Lincoln Rockwell lived in northern Virginia and was threatening violence to anybody who challenged the segregation laws there. In June 1960, we decided we had to challenge that law in Virginia. We did some additional nonviolence training, then went to the People’s Drug Store, a chain store. We sat down at the lunch counter and it was closed immediately. The owner refused to serve us, but didn’t have us arrested because he didn’t want the publicity. So we actually ended up sitting there for two days, and it was the most challenging two days of my life. Spirit: What happened? And did the American Nazi Party ever get involved? Hartsough: People came out and would spit at us in the face. They put lit cigarettes down our shirts, and others punched us in the stomach, sometimes so hard that we would fall on the floor, and then they would kick us. The American Nazi Party did come with signs saying, “Is We or Is We Ain’t Equals,” and a picture of an ape. They were yelling white supremacist nonsense and telling us to go back to Russia. Each time we were attacked we would try to respond in a nonviolent, peaceful way. It was very difficult. Spirit: Given that much violence and hostility, your very lives were in danger. His face had the most terrible look of hatred I’ve ever seen, and in his hand was a switchblade, a half-inch from my heart. It was quite miraculous. His face had been contorted with hatred, but his jaw began to drop and the hand holding his knife began to drop to his side — and he left the store. To me, at the age of 20, that was a pretty powerful experience. Nonviolence is not just a morally superior way of relating to people, but it’s probably the only thing I could have done and come out alive. But then we did something even more challenging. There were about 500 people outside the store with rocks who were threatening violence. We went to the front door and read a statement that we’d written appealing to the religious and community leaders in Arlington, Virginia, to use their influence to integrate all the eating facilities in Arlington. And this is the hard part: We said that if nothing changes, we’d be back in a week. Spirit: You were surrounded by hundreds of hostile people. How many of you were actually taking part in the sit-in? Hartsough: About 12. Some friendly media people got us out of there alive. Their cars were right outside the door. When we crossed the bridge back into Washington, D.C., it was like entering the freedom land, and getting away from all that. We literally shook in our boots for the next six days at the idea of having to find the courage to go back and do that again. On the sixth day, we got a phone call that the religious and community leaders had met. They went and talked with the business leaders and had gotten a commitment that within 10 days, the eating facilities would be opened (desegregated) in Arlington. And they were! Spirit: This sounds like it was a major turning point in your life. Was it? Hartsough: At the age of 20, this was the most important lesson of my whole life. Spirit: How would you describe the lesson you learned? Hartsough: When you see an injustice or violence or something terribly wrong, you can curse the television set or the president. Cursing the television doesn’t help very much. But instead, you can find some other people that share your vision of a just society, and who are committed to nonviolence in addressing that injustice, and have the courage to change it. Those are the alternatives we have. We can do nothing. We can get depressed and let the world go to hell. Or we can find others that share that vision and commitment and work with them. So, to me, that was a life-changing experience, and that’s the reason I’ve been involved in nonviolent movements and actions ever since. Many of the people that were part of these demonstrations in Virginia and Maryland became key people in SNCC, and were part of the Freedom Rides where the bus riders were beaten and buses got burned up, and the Mississippi Summer voter registration drive. So we were all cutting our teeth during these first sit-ins. 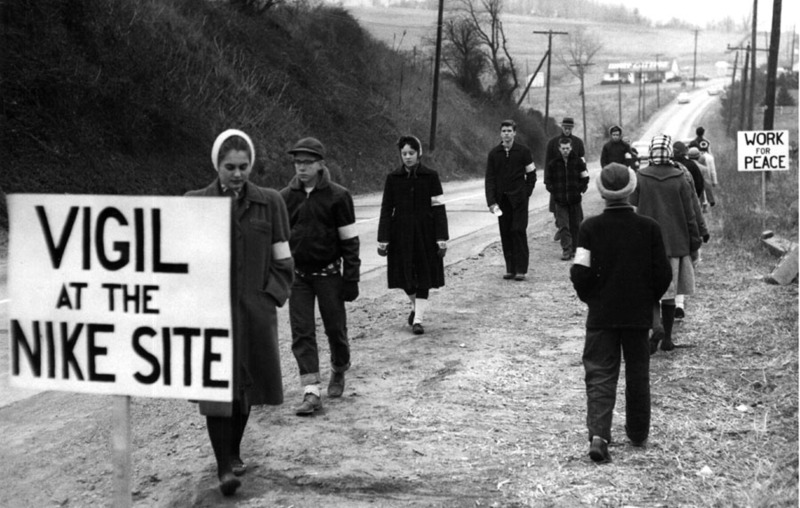 The first demonstration David Hartsough ever organized was at the Nike missile site near his home in Pennsylvania. Although he was only 14 at the time, the FBI placed him under surveillance for organizing the nonviolent protest. 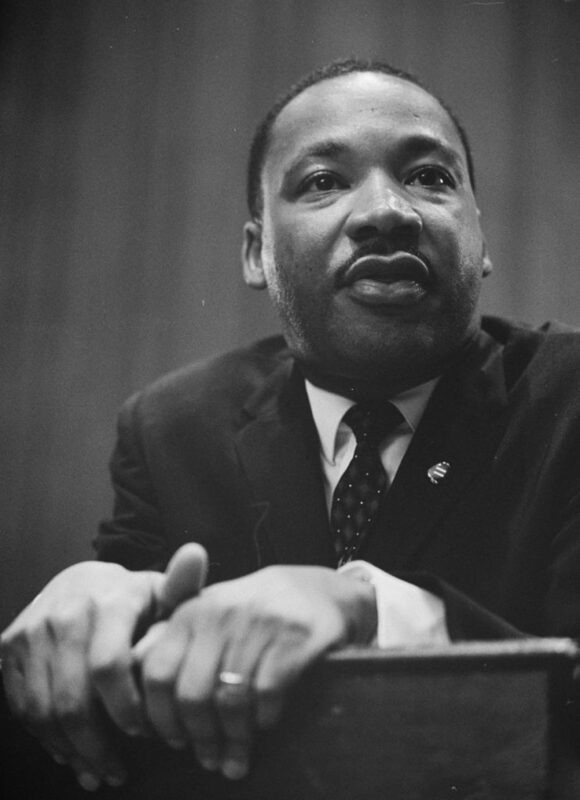 Spirit: King and other civil rights leaders began speaking out against the Vietnam War in the mid-1960s. Didn’t you also become deeply involved in the anti-war movement at this time? Hartsough: I was doing peacemaking work in my job with the Friends Committee on National Legislation (FCNL). Starting in the mid-1960s, FCNL asked me to be their lobbyist to try to stop the Vietnam War. My work was to interact with Congress and interact with peace movements around the country, including the Vietnam Moratorium. He wrote the letter, and the next day, we had four members of Congress reading the names of the war dead on the front steps of the Capitol. So when we were all arrested, the congressmen kept reading the names of the war dead because they had congressional immunity. They got through the whole 40,000 names of American war dead, or whatever it was at that point. Within a week or two, Look Magazine had a picture of every American that had been killed in Vietnam. And then people in the peace movement were reading the names of the war dead all over the country, at federal buildings and at post offices, inspired by what we had done. It was a small step to try to help build that movement. Our actions gave courage to Congress people and then other congressional representatives became involved. Spirit: While you were working against the Vietnam War for FCNL, Martin Luther King began speaking about the need to resist racism, militarism and poverty simultaneously, a vision that culminated in the Poor People’s Campaign. Were you involved with the Poor People’s Campaign while at FCNL? So King didn’t waste any more time in Washington. He went south and helped organize the voting rights campaign. That mobilized the conscience of the nation and within several months, we had a voting rights bill. Here I was a lobbyist in Washington, but that taught me that real change doesn’t come from the top down – it comes from the bottom up. Because of that, I was even more inspired by King and the power of nonviolent movements. So when he had the vision of the Poor People’s Campaign, my paying job was still lobbying to try to end the war. But on weekends, I had offered to do nonviolent trainings of people that were going to participate in the Poor People’s Campaign. Also, we were building the shacks, the shanties where poor people would live in Washington, D.C. Spirit: Amazing! You actually helped build the wooden shacks that made up Resurrection City? Hartsough: Yes, on the weekends we built the shacks with plywood and two-by-fours. We actually were building them on the grounds of a church on the edge of town, and then they were all going to be taken by truck to the Capitol. When the organizing for the Poor People’s Campaign began, King was speaking quite often at gatherings where hundreds of people would come from all over the country. It was just so very moving. I really had a feeling that we could transform America. Spirit: It seemed like the entire Freedom Movement had been building up to this moment — a showdown with the federal government to end poverty. Hartsough: I felt this was going to bring this country to its senses and build the kind of nonviolent people’s power that would mean that the power structure was going to have to address these issues. As you know, it was a very, very rainy spring and summer in 1968. So the shanties were often in two or three feet of water, and we had to build boardwalks so people wouldn’t get mired in the mud. Spirit: So Resurrection City became mired in the mud, and far worse, everyone was shocked and demoralized by King’s murder. It’s amazing that people were able to carry on with the campaign at all. Hartsough: Yes. But each day, a whole bunch of people from the Poor People’s Campaign would go and try to meet with Congress, and with people from the Health, Education and Welfare Department, and with various government agencies, trying to encourage them to do what needed to be done about poverty, housing and jobs. They developed a list of demands and walked from Resurrection City all the way down to the Capitol grounds to deliver these demands to Congress, trying to fundamentally address the poverty and injustice in this country. But when they got to the Capitol grounds they were all arrested — hundreds of people. Quakers were having a conference up in New Jersey at the time when they heard about the arrests. They decided that this is King’s last dream and vision of transforming this country, and when people nonviolently take their list of demands to Congress, they are arrested and thrown in jail. So we’ve got to do something. We can’t just be sitting around here talking. So several people from this conference, including Steve Cary, one of the most principled and courageous voices in the AFSC, went down and had a Quaker meeting for worship at the exact place where people had been arrested at the Capitol grounds. They brought a list of their demands and tried to walk up to the Capitol — and then we were arrested. Spirit: I know Steve Cary was a major inspiration to you, and to many other Quakers as well. What role did Cary play in getting Quakers to abandon their own conference to risk arrest with the Poor People’s Campaign? Hartsough: At the time, Steve Cary was the acting executive secretary of the national American Friends Service Committee. He was just a very thoughtful, courageous spokesperson who articulated the Quaker values of reverence for every human being and courageous struggle to fight injustice and war and militarism. And he walked his talk. Steve Cary was the head of AFSC programs in Europe after the Second World War when AFSC was awarded the Nobel Prize for its humanitarian work in post-war Europe. Europe had been devastated and AFSC got lots of Americans to go in and rebuild and get food to children. So after the mass arrests of people from the Poor People’s Campaign, Steve Cary led us in holding a Quaker worship in front of the Congress. Then we took the demands of the Poor People’s Campaign to Congress, and we were all arrested and spent two weeks in jail. Spirit: Many AFSC activists and Quakers worked with the civil rights movement through the years, so it seems fitting that they would end up in jail as part of King’s last campaign. Hartsough: We spent the next 14 or 15 days in the top floor of the D.C. jail, together with the hundreds of people from the Poor People’s Campaign from all over the country. In addition, there were hundreds of people, mostly black, that had been picked up off the streets in the riots after King had been assassinated. People were thrown in jail with very little evidence of what they had done, and none of them had been given a chance to go to court. And essentially, their story had not even gotten out to the public. One of the things we did after we got out of jail was to share with AFSC and the broader public that all of these folks had been sitting in jail since April 4. And they were still in jail in June! So that was the beginning of AFSC’s pretrial justice program where they were really challenging that whole unconstitutional practice. You have a fundamental right to appear before a judge before being thrown in jail and left to rot for months. Spirit: In looking back, how would you now measure the significance of the Poor People’s Campaign? What did it mean to you and what did it mean to the country? And what effect did King’s assassination have on this vision? Hartsough: Well, in the Poor People’s Campaign, Martin Luther King was calling not just for an end to segregation, and not just an end to the Vietnam War and militarism, but a transformation of this country so there would be economic justice for every human being. 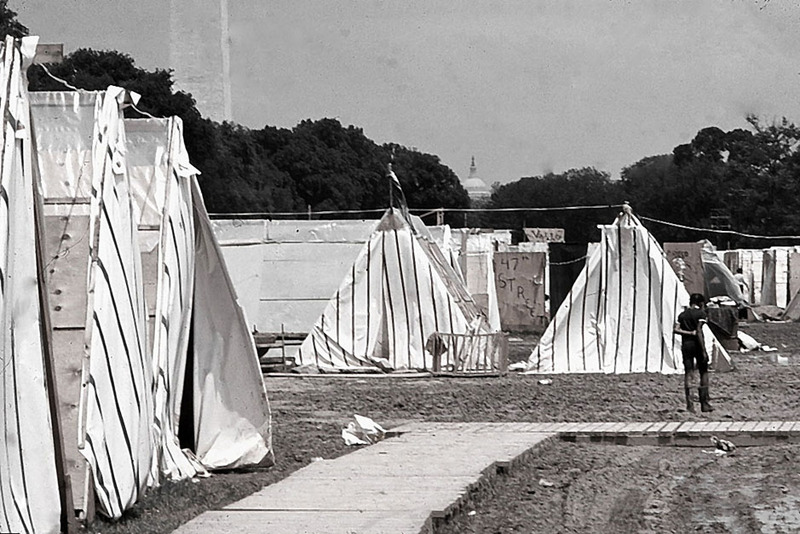 It was a brilliant and strategically thoughtful campaign to bring poor people from all over the country to Washington to camp out and nonviolently get in the way of business as usual until our government listened to the people and committed itself to ending poverty and injustice, and committed itself to developing real democracy and respect for every human being in this country. Unfortunately, he was assassinated before that could happen, but his staff and those of us who were left did our best to try to put together the Poor People’s Campaign. Many of us had been psychologically wounded by his assassination, and it was nowhere near as powerful as it could have been if he’d been here with us. But I do believe that the assassin may have killed King, but didn’t kill his dream and his vision of justice for all. It was vital to be a part of it and to see courageous people from all over this country, from all backgrounds and all colors, standing up nonviolently and speaking truth to power in the halls of Congress and in the Justice Department and the White House and all over Washington. To be in jail with hundreds of these people in that nonviolent struggle was a great experience for me. Some people think that the worst they can do is put you in prison. Yet it is really a privilege to be in prison with other people of conscience who are willing to put their lives on the line for justice. And getting to know people across the division lines of class and race and economic background is very important in strengthening our own sense that we’re all brothers and sisters, and we’re all children of one God. It sustains us and strengthens our commitment for the long struggle ahead. Spirit: You were involved in many actions during the struggle to end the Vietnam War. One action that really stands out is the People’s Blockade of ships transporting weapons to Vietnam. Hartsough: Around Christmas in 1971, a season when we’re thinking about the life of Jesus and his teaching to love one another and love our enemies, the United States started a major bombing of Hanoi and Haiphong. So now we were bombing major cities with children, women, old people, hospitals and schools. Many of us in Philadelphia in the Movement for a New Society decided that we had to do something more than just get out with a sign and protest. We had to somehow put our bodies between the bombs and the men, women and children they were killing in Vietnam. We found that there were bombs and munitions being shipped from the Leonardo Naval Weapons Station in New Jersey. So we scouted it out and found that napalm, anti-personnel bombs and all kinds of munitions were being shipped from Leonardo. We were able to recruit 26 canoes with 52 people, two in each canoe, and we decided to go out and try to block a ship called the USS Nitro. As we paddled out along the piers, the anti-personnel bombs and crates of napalm were just stacked high, ready to be loaded onto the ships. A military policeman yelled at us over his loudspeaker that we would be charged with criminal conspiracy if we didn’t leave this area, and could get 20 years in prison. We shouted back that 20 years would be terrible, but nowhere near as bad as the death and destruction that would be caused if these bombs reached their destination. And we kept paddling. We were actually able to get out in front of the ship each day for seven days. On the sixth day, some of the sailors we met told us it was leaving at 6:00 the next morning. Not only the hold of the ship, but all the decks were stacked 20 feet high with these crates of bombs and munitions. We got out there the next morning, and were paddling hard to stay right in front of the boat. As they lifted anchor, seven of the sailors jumped off the ship into the ocean and then joined our blockade. Spirit: Oh my God! Did they climb into your canoes? Hartsough: They tried to, but the military police grabbed them and put them back on the ship. But we had called the media, so the New York Times and the national television stations were there in their helicopters. So it was on the evening news, not only our blockade but also the seven sailors jumping ship. The seven sailors were then jailed in the brig. The news went all across this country and around the world, and the sailors told us later that when their ship went through the Panama Canal, word about the sailors on the USS Nitro jumping ship had spread to navy and military people all over the world, and the guys on the other ships gave them fists of solidarity and peace signs. Spirit: So the ripples from this action had spread very far and very quickly. Did it spark other acts of resistance? Hartsough: My feeling was that our actions had given these Navy sailors the courage to do what they knew was right to do, and their courage, in turn, gave courage to a lot of other soldiers in the U.S. military, and that was a beginning of a strengthened resistance within the armed forces to carrying out the terrible death and destruction in Vietnam. Our blockade spread from Leonardo, New Jersey, all up and down the East Coast and the West Coast of the Untied States. The national board of the American Friends Service Committee actually decided to support and endorse the People’s Blockade and to support AFSC staff working on it. Spirit: That was an incredible step into civil disobedience for AFSC to take. Were you part of the AFSC at this time? Hartsough: Yes, I was on AFSC’s Nonviolent Training and Action Committee at the time. Robert Levering and several of us that were part of that committee heard that there were also ships going from Norfolk, Virginia. So we went to Norfolk, and there was an aircraft carrier called the USS America that was preparing to leave for Vietnam. Aircraft carriers are massive. I had my nine-foot sailboat, so we organized a blockade down there with canoes and our small sailboat. They were very uptight as the USS America prepared to take off for Vietnam, and the military police came and capsized our canoes and sailboat. Then Navy frogmen came after us, grabbed us out of the water and took us on their ship. They put us in handcuffs face down on the ship with guys with guns pointed at us while the aircraft carrier sailed out to sea. It was a little bit scary. Another ship came with a water cannon when all these sailors were up on the deck of this aircraft carrier. Many of them were giving us signs of support and verbal encouragement. We thought the water cannon was going to be directed against us, but it was directed against the sailors. Spirit: They blasted the sailors with the water cannon just because they were cheering you on? Hartsough: Yes, because they were cheering us on! Next day, the Norfolk newspapers had a big photo of this massive aircraft carrier with our little boat in front of it. The ship was called the USS America, so the headlines said, “America Defeats Peace Flotilla.” America was standing tall again! They had defeated the enemy. Spirit: You mentioned earlier that the AFSC national board supported peace blockades around the country? Hartsough: AFSC members in both Northern California and down in Southern California were actively involved in helping organize blockades on the West Coast. In the Bay Area, it was called the Carrier Project, an official AFSC project. The AFSC board had decided it was willing to commit civil disobedience and support nonviolent resistance to the endless tragedy in Vietnam. Spirit: A photo in your new book shows you and your wife Jan Hartsough being arrested with your two young children. What happened at that protest? Hartsough: In 1971, Quakers who were very distressed about Nixon’s continuing this horrendous war in Vietnam decided to have a Quaker meeting for worship in front of the White House. About 250 Quakers sat down on the sidewalk in front of the White House. My wife Jan and I and our two young children, Peter and Heidi, were sitting on the sidewalk with all of the Quakers, and the police interrupted our worship service and ordered us to leave or be arrested. Nobody left, and people like Steve Cary, who was the associate executive secretary of AFSC, were there with us. All the other Quakers except my family were arrested. They apparently didn’t think it was good publicity to arrest this family with young children. So here we were, sitting on the sidewalk after everyone else had been hauled away in jail buses, and the D.C. chief of police came over and implored us to leave, saying that if we were arrested, our children would be taken away and put in juvenile hall. We told him that we certainly love our children, but we also love the children of Vietnam, and we’d be happy to leave if our government commits to stopping the bombing of Vietnam. He spent about half an hour trying to convince us to leave, and then placed us under arrest in a police car. He took us to a police station in Georgetown and let us out behind the police station — smart P.R. on his part. The Washington Post and AP and UPI had photographs of the police chief leaning over our family, trying to convince us to leave. The photo and article went out across the country, so many of our friends sent us photos from local newspapers all across the country. Those photographs are in our kids’ baby books. Spirit: Was it a hard decision for you and Jan to risk arrest with two children? Hartsough: I think a lot of people say that when you get married and have a family, you have to leave your values behind, and your concern about the rest of the people in the world. But we’re still a part of the human family, and people who get killed or maimed or imprisoned in another part of the world are also part of our family. So we’re not willing to give up our values just because we have children.